Sports are a great deal of fun, and they are great exercise. You should participate in sports that you enjoy as often as possible. One thing that you must be aware of, however, is how to prevent blisters during sport. 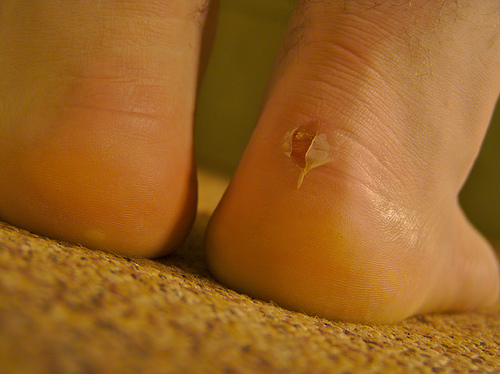 When a blister occurs, the sport no longer becomes much fun, and it may be a while before you can participate again. Simply put, friction causes blisters to form. Blisters form near the surface of the skin, and they are filled with fluid. They become more painful when they burst, exposing deeper layers of very tender skin. When shoes rub against the heel or the sides of the foot, gloves rub against the wrists or hands, or objects that you are holding rub against the hand, a blister is likely to form. Obviously, the way to prevent blisters is to prevent any friction. Naturally, gloves can prevent objects from causing blisters on your hands, but in some cases, the gloves can cause the blisters. Choose gloves that can be adjusted for the perfect fit. The glove should fit snuggly, and you need to be certain that the material that is around the wrist fits snuggly, as this is the most likely place that a glove could rub a blister on you. An alternative to a glove to prevent blisters on the hand is tape. Tape your hands well, but make sure that the tape fits firmly against the shape of the hand and the wrist to prevent friction. Sports tape works best, and you will want to shave the area before applying the tape. The only way to prevent blisters on the feet is to first wear cushioned, well fitting socks, and then add well fitting shoes. Most of us these days purchase our shoes in discount stores to save money, but sports shoes are best purchased from good old fashioned shoe stores, where the staff is knowledgeable about how the shoe should actually conform to the foot. Just as you can tape the hands and wrists, you can also use a good sports tape on the feet. This may require purchasing a shoe in a larger size, to accommodate for the tape. Make sure that you tape the areas where the shoe is most likely to rub your skin. Regardless of where the blister occurs, or what is causing it, as soon as you realize that a blister is forming, you need to stop the friction that is causing it. If the friction continues the blister can actually form even deeper, which takes longer to heal and is a great deal more painful. Deeper blisters will also scar, and run the risk of getting infected.